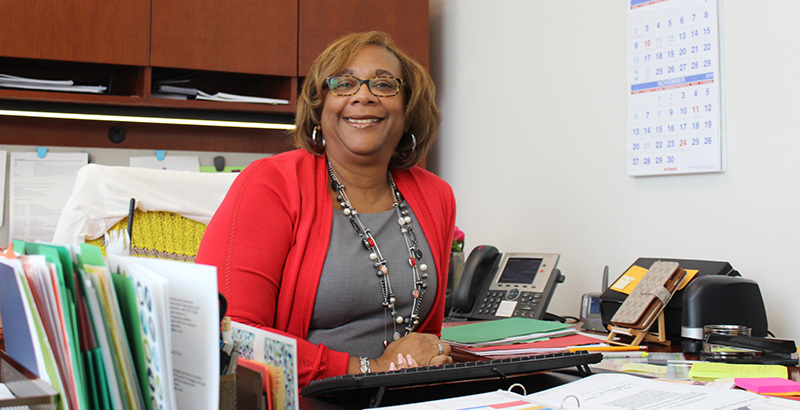 A basket filled with a variety of colorful Lifesavers by the window inside Dana Singleton’s office is a fitting metaphor for her role as dean of student services on Tidewater Community College’s Portsmouth Campus. Singleton is a problem solver and sounding board, a resource for those she meets in her office or during her regular strolls across campus where she could encounter a quick-fix issue or a large-scale crisis. If a testing center is closed because a student misread the website, Singleton steps in to deal with that frustration. If a student is angry over an answer received from admissions or another area that falls under student support, Singleton intervenes. She’s often an investigator, getting to the bottom of a disciplinary incident. Singleton is adept at finding solutions, often in the direst of situations. Sometimes that means lack of transportation for a student trying to make it to class. Other times it could be a student facing homelessness. “If I can help, I help,” she said. Prior to TCC, the Emporia native worked as a teacher and administrator in Chesapeake Public Schools and worked at Norfolk State University as an administrator. Drawn to TCC first as an adjunct, she became the Portsmouth Campus’ inaugural First Year Success coordinator and started the summer bridge program there, which allows incoming freshmen to earn college credit and undergo orientation to the campus environment and college life, during the summer after high school graduation, setting them up with the tools they need to succeed. Instead, Singleton was happy being a behind-the-scenes worker bee. But her past experiences had her completely comfortable embracing a leadership role. Active in her sorority, Alpha Kappa Alpha Inc., Singleton enjoys spending spare time with family, friends and sorority sisters in addition to traveling and dining in good restaurants. She has one daughter and a 2-month-old grandson.